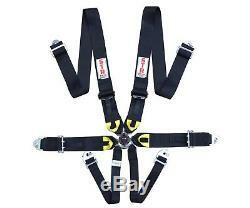 6-Point FIA Approved Aircraft Quick Release Style Race Harness. STR Race Equipment is manufactured under strict quality control procedures. FIA approved Aircraft Style 6-point harness with quick release type buckle, aluminium shoulder adjusters and steel waist strap adjusters. This buckle style is ideal for use in many forms of motorsport. The Aircraft buckle is very popular in drag, rally and circuit racing. This harness is supplied with 1.8m long shoulder straps and snap hook fittings to allow quick release of the full harness. 6-Point harness with new technology Aircraft quick release style buckle. Aircraft clip - popular in rally, circuit and drag racing. Aircraft securing device allows for quick removal of harness in an emegency. 3 Strap Width on shoulder and waist straps. 2 Strap Width on crutch strap for comfort. Crutch strap reduces the risk of submarining. Lighweight aluminium shoulder adjusters - easy to adjust and comfortable to wear. Shoulder straps can be shortened for attachment behind the driver to the roll cage or can be extended to 1.8m. Snap hook connections allow for quick installation & removal of harness. Please consult FIA & manufacurer guidelines for installation of the harness. The effectiveness of this harness is directly related to the way in which it is installed, used and maintained. The user assumes that risk. See instructions for correct installation which should only be done by a qualified professional. Harnesses should be replaced following an accident, or when the webbing or hardware is damaged in any way or does not function properly. It is the responsibility of the wearer to ensure the harness is secured and not damaged or altered in any way. Harnesses should be inspected before use and should be replaced regularly. Harnesses should be replaced after any collision or in any event that may affect the integrity of the harness. Submarining' can occur during a vehicle collision where the victim is propelled violently under the lap belt. It can result in serious injuries or death. Submarining can occur even in low speed collisions. To complement these belts, we have a range of SFI & FIA Approved products available in our online store. The item "STR 6-Point Race Harness FIA 8853-2016 (2023) Safety Seat Belt IVA Safe BLACK" is in sale since Monday, April 30, 2018. This item is in the category "Vehicle Parts & Accessories\Car Tuning & Styling\Interior Styling\Harnesses, Belts & Pads". The seller is "mcgillmotorsport" and is located in Kirkcaldy. This item can be shipped worldwide.